What are the different parts of a datalogger? What is the role of a datalogger in a data acquisition system? Where can dataloggers be used? How do datalogger models differ from each other? How do you select the datalogger model that is right for your application? A datalogger is a device used to record and store the output of one or more sensors. In some cases, the datalogger interprets the electical signal from the sensor and converts it to units. In cases where a smart sensor provides digital output, the datalogger simply records the data. Early dataloggers were strip chart recorders that recorded measurement data onto paper. Over time, dataloggers evolved to store data digitally on various types of media. Today, data is typically stored on modern flash memory and often transmitted via a variety of telemetry methods. Note: Similar terms for "datalogger" include "data logger," "data recorder," "data acquisition system," and "RTU" (remote terminal unit). Which term is used often varies by industry or discipline. Today, a wide range of devices are referred to as "dataloggers," and they can vary greatly in their functionality. For example, one datalogger may be packaged together with a sensor for a single application-specific purpose, such as measuring temperature. Another datalogger may be a general-purpose device that is used in many different applications to log data from multiple sensors of varying types.For the purpose of this discussion, our focus will be on general-purpose dataloggers. In addition to their measurement and monitoring functions, some dataloggers can trigger an alarm or notification, as well as control an external device, in response to any of the following: a specific, measured site condition; time of day; or event. For example, a datalogger may be programmed to respond to a measured rise in water level by closing a floodgate and sending a notification to personnel. A facility may individually select each of their data acquisition system’s components, thereby creating a customized solution that will meet their specific needs. The datalogger can be programmed to scan the sensors of the data acquisition system repeatedly after a specified interval has passed (the scan rate), under specified conditions, or after the occurrence of a particular event type (such as rainfall). A sophisticated datalogger can receive the electrical signals from the sensors, perform any programmed calculations, convert the data as necessary to other units of measurement, and store the resultant data in the datalogger’s memory. The datalogger’s acquired data and calculated values will need to be transferred to a PC or other device for increased access, sharing, analysis, and reporting. A variety of methods can be used to accomplish this, including communication peripherals with onsite and telecommunication options. While many general-purpose dataloggers are designed to be installed in protected environments, some are specifically developed for extreme environmental conditions. These extreme environments include mountainous terrain, deserts, jungles, mines, oceans, and glaciers. A datalogger is typically left unattended for lengthy periods to automatically process and record measurement data from a variety of sensors until the monitoring period ends, which may be decades later. The universal application of dataloggers in climates across the world, from the poles to the equator, is often attributed to their ruggedness, compact size, wide operating temperature ranges, low power usage, and capability of operating in diverse environments. The universality of sophisticated dataloggers is further enhanced by their many connection types and programmable inputs, which enable them to measure almost any commercially available sensor. Because dataloggers provide a comprehensive, accurate, and reliable depiction of the monitored conditions without the need for site visits, they are an indispensable tool for unattended, long-term monitoring and control for numerous industries and applications. In this illustration, several different types of general-purpose dataloggers are displayed. These different types enable dataloggers to accommodate a wide variety of measurement applications. These characteristics are discussed briefly in the following sections. In general, the size of the datalogger is dictated by the number of inputs and outputs (I/O) and connection points. Smaller dataloggers have a smaller footprint requirement, which enables a facility to use a smaller enclosure that is less expensive and less noticeable. A smaller datalogger, however, is limited in functionality because fewer sensors or peripherals can be connected to it. Even if a datalogger isn’t housed inside an enclosure, there may be space restrictions at the site that prohibit the use of a larger datalogger. Although some manufacturers may not conform to this convention, the published operating temperature range typically refers to the range at which the datalogger will operate within its specified measurement accuracy. Measurements may still be recorded outside of this temperature range, but the accuracy of the measurement may be in question, and the datalogger may not perform as expected. Other operational errors may also occur. Some dataloggers only have a standard operating temperature range, whereas other dataloggers may offer an extended temperature range option that is useful in environments with more extreme temperatures. The wiring panel of a datalogger provides terminals for connecting sensors. These terminals enable the datalogger to measure, communicate with, and power the sensors. Some dataloggers can scan almost any sensor with an electrical response—whether the sensor’s signal output is voltage, current, pulse, digital, or serial. However, for the datalogger to interpret the sensor’s signal, the signal output from the sensor must be compatible with the datalogger input terminal to which it is connected. Typically, the instruction manual of a sensor provides information regarding which type of datalogger connection is required, as well as how to wire the sensor to the datalogger. These terminal types are discussed briefly in the following sections. Pulse counters are used by the datalogger to measure switch closures, low-level ac sine waves, or high-frequency pulses. Pulse counters sum the number of counts over each execution interval (scan rate), allowing variables such as rpm, velocity, flow, and rainfall intensity to be determined. Switched voltage excitation outputs are used with sensors that measure voltage resistance. These outputs provide programmable voltage excitation for resistive bridge measurements by switching the voltage on and off. The bridge measurements are the ratio of the voltage output to the excitation voltage, eliminating any errors in the excitation voltage. By default, digital I/O ports are configured as binary inputs to perform functions such as detecting status or reading SDM peripherals. In addition, each port can be individually programmed as a control output to physically control an external device. RS-232, RS-422, and RS-485 ports are used to connect the datalogger to smart serial sensors and communication devices. These terminals can be regulated or unregulated power sources for sensors and other peripheral devices. The 12 V terminal is generally used as an unregulated continuous power source for sensors and other devices. A switched 12 V terminal is used to power devices such as sensors that only require power periodically. These terminals are controlled by the datalogger to power the sensor only during measurements. The wiring panel of a datalogger also provides terminals for connecting power supplies, communication peripherals, and external control devices. The input and output connections on the wiring panel enable the datalogger to communicate with and power various peripherals. Continuous analog outputs provide voltage levels to peripheral devices or proportional controllers. This allows the datalogger to have control over other devices, including digital displays and controlled devices such as proportionally controlled gates. Dataloggers often are used as measurement devices within a SCADA (supervisory control and data acquisition) system. The continuous analog outputs can then be used to send data directly from the datalogger to a PLC (programmable logic controller). These ports are used to communicate with other expansion devices that are unique to the specific manufacturer. These terminals are used to connect the datalogger to an external power supply. Because these terminals can be easily removed, they provide a quick-disconnect option. A datalogger may allow the expansion of its input and output capabilities using expansion modules, such as Synchronous Devices for Measurement (SDMs), and multiplexers. These add-on modules and multiplexers enable the datalogger to measure more sensors by increasing the number and type of connections available beyond what the datalogger provides on the wiring panel. Control modules increase the number of devices that can be controlled by the datalogger. Accuracy is the ability of a measurement to provide a result that is as close as possible to the actual value. For example, a datalogger that produces a measurement within ±0.1 of the actual value is said to be more accurate than a datalogger that produces a measurement within ±0.5 of the actual value. Accuracy is often listed by the manufacturer at a specific temperature (typically 25°C). Some manufacturers will specify accuracy over a temperature range. Precision is the amount of agreement between repeated measurements of the same quantity. For example, a datalogger that produces 10 measurements of the same sample within ±0.1 of each other is said to be more precise than a datalogger that produces 10 measurements of the same sample within ±0.8 of each other. In measurements, resolution refers to the smallest change in a quantity that can be detected. For example, if one datalogger detects a difference to the nearest tenth of a millivolt, that datalogger is said to have higher resolution than another datalogger that detects a difference to the nearest whole millivolt. Depending on the manufacturer, some dataloggers cannot differentiate between the interval at which they scan (measure) the sensor and the interval at which they record the measured value. (The two rates are treated as being the same.) The datalogger will scan the sensor based on a selected record interval, and every measured parameter is recorded with each scan. In contrast, a sophisticated datalogger can be programmed to scan a sensor based on a time scan rate, under specified conditions, or in response to an event. Programmed scan rates can vary greatly, depending on the datalogger model, and may range, for example, from once every few hours to 100,000 times per second (Hz). It is important to note that every single measurement from the scans does not need to be recorded. For example, if a sensor is scanned every five seconds (the scan rate), only an average reading for a 15-minute period (the sample rate) may need to be recorded. The maximum scan rate is the highest frequency at which the datalogger scans the sensors. For example, dataloggers may range from a maximum scan rate of 1 to 100,000 Hz. A datalogger with a slower maximum scan rate may be less expensive, but the rate at which parameters (such as rainfall) can be measured and recorded is limited. Consequently, less measurement data is available for a specified period compared to the amount of data that could be acquired during the same period using a datalogger with a faster maximum scan rate. To transfer data from a datalogger to a central location, such as a base station PC or cloud-hosted database, a datalogger may have integrated communication capabilities, or it may be able to interface with an external communication device. These devices may support a hardwired connection (such as Ethernet), wireless cellular, or Wi-Fi. Various other communication options such as satellite or frequency-hopping spread-spectrum radios are also used. A datalogger may be equipped to control external devices—in addition to providing advanced measurement and monitoring capabilities. As a control mechanism, a datalogger can be programmed to activate a device at a preset time, in response to a measured condition, or in response to an event. Dataloggers can activate or shut down motors, gates, pumps, purifiers, valves, injectors, etc. For example, if a temperature level rises above a predetermined maximum, the system can activate HVAC equipment. Moreover, control functions can be based on multiple conditions or events, such as deciding to initiate or suspend air exchange based on time of day, outside temperature, and/or inside temperature. Some dataloggers can perform basic processing of the data collected from the system’s sensors. Examples include the calculations of daily minimums, maximums, averages, totals, or other statistical values. Moreover, parameters such as the following can be calculated using the data provided by sensors: density altitude, dew point, evapotranspiration, heat index, and wind chill. By providing onsite statistical and mathematical processing, the datalogger can record just the calculated values rather than all the individual measurements. This provides the needed information in fewer numbers, simplifying the data analysis or review process. Because the frequency of recorded measurements is decreased, the quantity of data stored is reduced significantly. By reducing your quantity of stored data, you can prolong the time before your datalogger’s memory becomes full and needs to be downloaded, as well as decrease the amount of data that is being transmitted via the cellular or other wireless communication devices. The communication protocol is the system of rules that manages how data is exchanged between the datalogger and other devices. This includes communication between the datalogger and external measurement devices within the data acquisition system, between the datalogger and other dataloggers within a network, and between the datalogger and the PC or server. The protocol is particularly important when integrating a datalogger with an existing system to ensure that the system devices and the datalogger can all use the same protocol to communicate with each other. The communication protocols may be proprietary to the manufacturer of the datalogger, external devices, or software. These protocols may also be developed and managed by third-party organizations such as Modbus, DNP3, SDI-12, or FTP. Some dataloggers have an integrated or detachable keyboard display that includes a screen and keypad. The display enables the user to view measured data, generally in both real-time and historical formats. The keypad functions of the display may also provide the user with the ability to program, configure, and analyze the datalogger while in the field—without the need for other external communication devices such as laptop computers, smartphones, or tablets. Knowing how frequently the sensors are scanned (scan rate), as well as how frequently data measurements and/or calculated values are recorded (sample rate), provides helpful information in determining how long a datalogger can record data before the memory capacity becomes full and requires downloading. Unless the datalogger has a display screen, data that is stored in the internal memory of the datalogger must be physically transferred to a PC or other web-browser-enabled device for visualization, analysis, sharing, report generation, and permanent storage. The internal data memory, program, communications, and operating systems are stored in SRAM or RAM memory. Depending on the type of memory storage used, this memory is backed up by an internal lithium battery. In the event of power loss or when the datalogger is not connected to an external power supply, the battery maintains the memory and clock. If a datalogger’s memory capacity is not sufficient to meet a facility’s scan rate and sample rate needs, an external data storage device may be purchased and used as well. Using an external data storage device provides a redundant data resource if the memory on the datalogger becomes full, resulting in data loss. Selecting a datalogger is an important decision that requires careful consideration. For assistance with the selection process, review the detailed Purchase Considerations section. To assess the numerous general-purpose datalogger models and ultimately determine which one will best meet your needs, you should first identify your application’s needs and requirements. If necessary, review any related documentation, permits, or regulations. Your familiarity with these items will help ensure that the datalogger you select will meet your compliance requirements. If the datalogger is not designed for the environment in which it is located, the datalogger may not perform as expected or stop working. The high and low temperatures at your site will determine whether you can use a datalogger with a standard operating temperature range. If your site’s high and low temperatures are beyond the temperature capability of the datalogger, select a datalogger with an extended temperature range. If your datalogger will be subjected to vibrations—such as from bridges, mines, or construction sites—ensure your datalogger is designed to endure those conditions. Also, if you anticipate that your datalogger will be dropped or bounced, verify that it can withstand those shocks. If your datalogger will be placed in a humid or wet environment, check that it can handle the moisture level. You can protect your datalogger by housing it inside a sealed environmental enclosure. Select a datalogger that will fit inside the enclosure you intend to use at your site. To keep the inside of the enclosure dry, use desiccant. Different sensor types require different input types on the datalogger that can interpret the sensors' signals. Dataloggers vary greatly in both the quantity and types of connections they offer for sensor inputs. You will need to ascertain how many sensor inputs of each sensor type your datalogger needs to accommodate all your sensors. An expansion peripheral can significantly expand the number and types of sensors your datalogger can measure. If the number or types of sensors you will be using exceeds the inputs available on a datalogger, you may be able to use a compatible expansion peripheral. Moreover, consider how your facility’s long-term goals may differ from the current goals and require additional inputs and/or outputs on the datalogger. You may already own sensors that you plan to use in your data acquisition system. Ensure that these sensors are compatible with the datalogger you select. Whereas precision and resolution of a data acquisition system may be directly related to the performance of the datalogger, the system’s accuracy is often determined by the least accurate component in the system. Accuracy is the ability of a measurement to provide a result that is as close as possible to the actual value. For example, a datalogger that produces a measurement within ±0.1 of the actual value is said to be more accurate than a datalogger that produces a measurement within ±0.5 of the actual value. Although the overall accuracy you can attain is determined by the least-accurate component in your system, check that your datalogger provides a suitable accuracy level for your requirements. Note that accuracy levels differ depending on the temperature range. Precision is the amount of agreement between repeated measurements of the same quantity. For example, a datalogger that produces 10 measurements of the same sample within ±0.1 of each other is said to be more precise than a datalogger that produces 10 measurements of the same sample within ±0.8 of each other. Match the level of precision of your datalogger with your measurement data needs. In measurements, resolution refers to the smallest change in a quantity that can be detected. For example, a datalogger that detects a difference to the nearest tenth of a millivolt is said to have a higher resolution than a datalogger that detects a difference to the nearest millivolt. To improve your absolute resolution, use the lowest/smallest fixed voltage range possible that will cover the output range of the sensor being measured. Programmable dataloggers offer options for scheduling scans, as well as developing and running customized programs. A programmable datalogger can be scheduled to scan a sensor based on a programmed scan rate, under specified conditions, or in response to an event. Some dataloggers don’t require the recording of every single measurement from the scans. For example, if a sensor is scanned every five seconds (the scan rate), only an average reading for a 15-minute period (the sample rate) may need to be recorded. Make sure the datalogger you select has a level of flexibility appropriate for your needs. While some dataloggers are hardcoded to only perform a core set of functions, other dataloggers have a built-in, full programming language to allow users the flexibility to develop and run their own customized programs. Determine the skill level of the user who would potentially program the datalogger, as well as the needs of your facility to develop its own programs. Select a datalogger that will match well. A sophisticated datalogger may have onboard algorithms that can calculate daily minimums, maximums, averages, totals, or other statistical values. Moreover, parameters such as the following may be calculated using the data provided by sensors: density altitude, dew point, evapotranspiration, heat index, and wind chill. By providing onsite statistical and mathematical processing, a sophisticated datalogger can record just the calculated values rather than all the measurement values. This minimizes the amount of data that needs to be stored and transmitted by the datalogger, prolonging the time before your datalogger’s memory becomes full and the data need to be downloaded. In addition, with less data, the cost to retrieve the data may be reduced (depending on the method used), and the data analysis or review process may be simplified. Some dataloggers can be programmed to control external devices, such as activating a device at a preset time or in response to a measured condition or event. Dataloggers can activate or shut down motors, gates, pumps, purifiers, valves, injectors, etc. If you need the datalogger to control external devices, verify that the datalogger, or the datalogger combined with a terminal expansion peripheral, has this capability. Knowing how frequently the sensors are scanned, and how frequently data measurements and/or calculated values are recorded, provides helpful information in determining how long a datalogger can record data before the memory capacity becomes full and requires downloading. Selecting a datalogger by memory size alone may not prove advantageous. Instead, it may be more beneficial to consider storage capacity in terms of how many readings the datalogger can store. It is possible for a datalogger to have many kilobytes or megabytes of memory but only be able to hold a small quantity of readings. Review the datalogger’s specifications for both the memory size and the quantity of readings the datalogger can store. 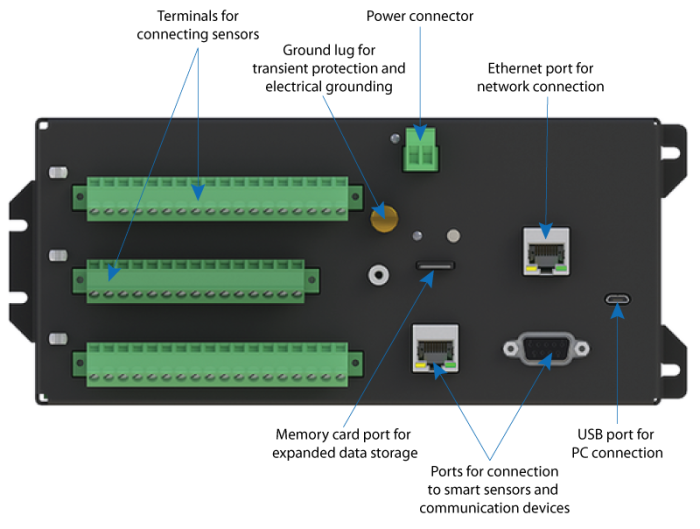 If the datalogger’s onboard memory capacity is not sufficient for your project, find out if compatible memory expansion peripherals are available. Review the specifications for a datalogger to determine if it uses fill and stop memory, or if it uses ring memory. This can help you determine how frequently your facility needs to download the data, and then you can schedule your data retrieval accordingly. If a datalogger loses power because of a power failure or from being powered down, it is necessary to ensure that your data will not be lost as a result. Different types of storage media provide different protection in this regard. A volatile storage medium, such as SRAM, will eventually lose its data. Consequently, a volatile storage medium should be battery-backed to ensure the data is maintained while the datalogger is disconnected from its main power source. If you anticipate that the power supply to your datalogger may experience frequent planned or unplanned power outages, select a datalogger with either a non-volatile data storage medium or with a battery-backed volatile data storage medium. The ability of a datalogger to communicate with other components in your data acquisition system depends on the communication protocols the datalogger uses, the datalogger’s integrated communication capabilities, and the datalogger’s compatibility with communication peripherals. Dataloggers vary in their support of the different communication protocols available, such as DNP3 or Modbus. Review the datalogger’s supported protocols to determine if the datalogger shares a common communication protocol with your other system components. Determine if the datalogger has integrated IP communication capabilities, such as an integrated Ethernet terminal, or if it can be integrated with an external communication peripheral. Depending upon the limitations of your site, you may have to rely on onsite options such as cables connecting the datalogger directly to a PC or laptop. Another onsite option is to use an external data storage device with a memory card that can be transported and uploaded to a PC at an offsite location. Check the compatibility of the datalogger with the various data retrieval and communication options you are considering. If you need to use a cable to connect your datalogger and computer, calculate the cable length you need. A standard RS-232 cable may only come in a length of 50 feet. To increase the connection length up to a few thousand feet, a converter is needed. If wireless transmission is available, you can use a telemetry peripheral to transmit data remotely. The following are some possible telecommunication options: Ethernet, multidrop network, radio frequency (RF) network, satellite system, short haul modem, landline phone, voice-synthesized phone, and cellular phone. Check the compatibility of the datalogger with the various data retrieval and communication options you are considering. Each telecommunication option has its own requirements that should be reviewed. For example, review the transmission distance or area of each option, as well as its applicable service requirements. You may find that a particular option is not available or does not provide the coverage you need. Using a communication peripheral, some dataloggers may be programmed to send regular notifications to personnel regarding the current conditions at the site. In addition, if an atypical event occurs, a datalogger can be programmed to trigger an alarm (such as a phone call, bell, whistle, light, etc.) to notify personnel who can make any necessary decisions and adjustments to their system. Determine which parameters the datalogger will use to automate notifications or alarms, and ensure that the datalogger can be suitably programmed. Some dataloggers offer a built-in keyboard and display, and other dataloggers may offer a separate, portable keyboard and display screen. Personnel can use these devices to respond to prompts and messages from the datalogger at the measurement site. Instead of using a keyboard with display to interact with an onsite datalogger, it may be possible to use a laptop computer. A datalogger's power needs should be considered when determining a power budget for an entire data acquisition system. Review the listed power requirements of the datalogger to understand its typical current drain for both active and quiescent states. Some dataloggers can provide the power to operate sensors and other devices. To reduce power drain, consider selecting a datalogger that is able to switch the sensor power on only when a reading is taken. Some data acquisition systems are installed in locations that do not have access to ac power and require the use of an internal sealed rechargeable battery or alkaline batteries—in combination with a battery charging device such as a solar panel. Whatever power source is used, ensure that you will have enough power supply for continuous sampling. Estimate the power requirements of your datalogger and entire data acquisition system using a power budget. After downloading the new OS for the datalogger from the Campbell Scientific website, what needs to be done to upload it to the datalogger? Can a datalogger accept PakBus connections from multiple terminals simultaneously? The CR1000, CR800, CR850, and CR3000 can accept PakBus connections from multiple terminals simultaneously, provided that all of the connecting nodes have unique PakBus addresses. Do Campbell Scientific dataloggers have nonvolatile memory? Yes. All Campbell Scientific dataloggers currently have nonvolatile memory. Nonvolatile memory was added to the CR10X in 1996. All datalogger models introduced since then have included nonvolatile memory. Nonvolatile memory is reliant on the 3 V lithium battery inside the datalogger. As long as this internal battery has a charge above 3 V, no data should be lost if the datalogger loses power. Do Campbell Scientific dataloggers directly support the BACnet communications protocol? Campbell Scientific dataloggers do not directly support BACnet, but an industrial protocol converter can be used to add a datalogger to a new or existing BACnet network. The protocol converter sits between the datalogger and the network, and it converts BACnet requests to a protocol supported by the datalogger, such as Modbus, DNP3, SNMP, or others. For more information about BACnet, see the “BACnet to Modbus/Modbus to BACnet Protocol Conversion” application note. Can the datalogger be damaged by wiring the sensors to the wrong ports? Possibly. If a voltage greater than 16 Vdc is applied to the wiring panel, it could damage the input and result in inaccurate measurements. Additionally, in some cases the sensors can be damaged if they are wired to the wrong channels. If a sensor, wired into an analog input channel, has an output of more than 5 Vdc, measurements on adjacent analog input channels may be upset. For example, the maximum full-scale range on the CR5000 is ± 5Vdc. Do Campbell Scientific dataloggers directly support the Profibus communications protocol? Campbell Scientific dataloggers do not directly support Profibus, but an industrial protocol converter can be used to add a datalogger to a new or existing Profibus network. The protocol converter sits between the datalogger and the network, and it converts Profibus requests to a protocol supported by the datalogger, such as Modbus, DNP3, SNMP, or others.